It is a ‘multi-author’ book and covers topics from low-level programming up to software development life cycle. That kind of book makes it easy to pick and read one chapter or the other, as I do not need to read the book from the beginning to the end. It is a good reference manual, and covers many aspects I’m interested in, but never had the time yet to read it. I have reading time reserved for the coming long week-end, given the weather forecast 😉 . This entry was posted in Embedded, Thoughts and tagged Building, Debugging, science, software, technology, Thoughts by Erich Styger. Bookmark the permalink. Congratulations! i do believe I shall read some myself 🙂 Which is the appeal of this compendium – truly relevant topics, self contained, that you can pick and choose. Congratulation on your book! It looks very interesting. I wanted to ask you, for which level of expertise on MCU embedded development would you recommend this book for? Beginner, intermediate or advanced? 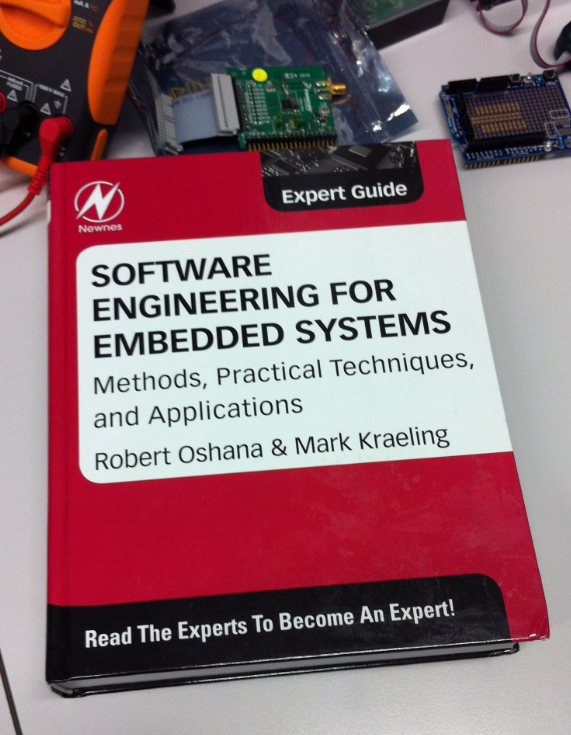 Also, do you have a recommendation on additional books to learn about embedded development in a formal, expert way? I develop embedded projects but lack a more professional (formal) method, and I would like to enter the industry and begin to develop programs in a more formal and optimal way. thanks! Any level depends on what you are looking for, and as well the industry you are working in. I would say it is on the intermediate to advanced level. It varies somewhat between chapters. As for suggestions: that again depends on the domain you are interested in (robotics, health care, automotive, communication, …): as for general Embedded topics, I recommend the books or articles written by Jack Ganssle: they are very informative, easy to read with a good sense of humor, so a lot of fun too. Thank you very much! I will look for the autor you recommended, and I will also look if I can get your book on my country or when I visit the USA. Thanks! nice man! saw which chapter you contributed in the comments, you should’ve put that in the article! Actually saw that book on safari online and star’ed it. I was too shy, and I believe it is not much about what I have contributed, but about the great (again: biased 🙂 ) content of the whole book. Order the book today. Excited to give it a read. I find that there is not much reading available on the actual software design (design patterns, etc) when it comes to embedded systems. yes, I agree with you on that point. I hope you will enjoy reading the book! If you buy the hard copy, is there a discount available for the e-book as well? as i generally like having both. One at home for reading and the other at work for simple look-up. yes, according to http://store.elsevier.com/product.jsp?isbn=9780124159174 there is a 40% discount listed for the printed+e-version of the book. I bought the book and started reading your chapter, it’s a great design for events and triggers handling in Embedded Systems. Did you write any other books or material that I could read and learn great software designs. Thanks for reading that book, and your kind words! I have not published any other books that way (maybe I should), but I do have the university lecture script, but that one is not public (except to students). Contact me under the email address listed on the About page of this blog and I should be able to send you a PDF copy for your own personal use.